Plug those acoustic gaps around electrical boxes and wall systems in your recording space! 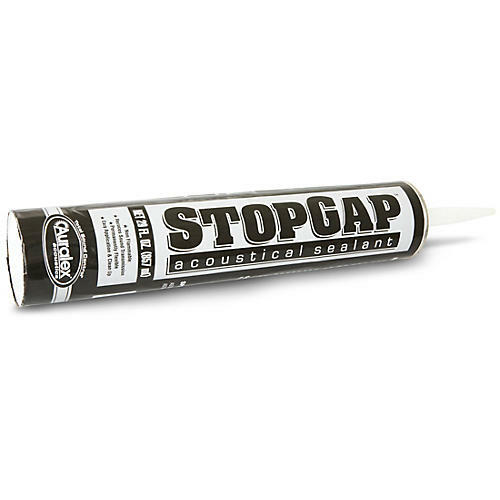 StopGap Acoustical Sealant is a highly elastic, water-based sealant used for reducing sound transmission. Works at the perimeter of wall systems or around electrical box cutouts to achieve specified STC/MTC values. The surface dries to a tough film but the sealant remains flexible and stays pliable up to 5 times longer than alternative brands. And unlike other products, Auralex Stop-Gap has no residual run-off. StopGap is paintable and non-staining, and meets ASTM C-834 standards for flame retardancy. StopGap comes in a large, 29 oz caulking tube and therefore requires a larger than normal-sized caulking gun, which can be purchased at any local hardware store. Coverage per 29 oz. cartridge is approximately 40 linear feet when a 3/8 inch bead is applied. Click or call now to put a stop to sound leakage.